Ballet originated in the Italian Renaissance courts of the 15th and 16th centuries before being spread from Italy to France by an Italian aristocrat, Catherine de' Medici, who became Queen of France. In France, ballet developed even further under her aristocratic influence. The dancers in these early court ballets were mostly noble amateurs. Ballets in this period were lengthy and elaborate and often served a political purpose. Ornamented costumes were meant to impress viewers and restricted performers' freedom of movement. French court ballet reached its height under the reign of King Louis XIV. Known as the Sun King, Louis symbolized the brilliance of France. In 1661 Louis founded the Académie Royale de Danse (Royal Dance Academy) to establish standards and certify dance instructors. In 1672, Louis XIV made Jean-Baptiste Lully the director of the Académie Royale de Musique (Paris Opera) from which the first professional ballet company, the Paris Opera Ballet, arose. Lully is considered the most important composer of music for ballets de cour and instrumental to the development of the form. Ballet went into decline in France after 1830, though it continued to develop in Denmark, Italy, and Russia. The arrival in Europe on the eve of First World War of the Ballets Russes of Sergei Diaghilev, revived interest in the ballet and started the modern era. The Russian choreographer Michel Fokine challenged tradition and called for reforms that reinvigorated ballet as an art form. In the 20th century, ballet had a strong influence on other dance genres, and subgenres of ballet have also evolved. In the United States, choreographer George Balanchine developed what is now known as neoclassical ballet. Other developments include contemporary ballet and post-structural ballet. Also in the twentieth century, ballet took a turn dividing it from classical ballet to the introduction of modern dance, leading to modernist movements in several countries. Famous dancers of the 20th century include Rudolf Nureyev, Margot Fonteyn, Rosella Hightower, Maria Tall Chief, Erik Bruhn, Mikhail Baryshnikov, Suzanne Farrell, Gelsey Kirkland, Natalia Makarova, and Arthur Mitchell. Maiden Tower written by Afrasiyab Badalbeyli is the first ballet in the Muslim East. Stylistic variations have emerged and evolved since the Italian Renaissance. Early, classical variations are primarily associated with geographic origin. Examples of this are Russian ballet, French ballet, and Italian ballet. Later variations, such as contemporary ballet and neoclassical ballet, incorporate both classical ballet and non-traditional technique and movement. Perhaps the most widely known and performed ballet style is late Romantic ballet (or Ballet blanc), a classical style that focuses on female dancers (ballerinas) and features pointe work, flowing and precise movements, and often presents the female dancers in traditional, long white tutus. Romantic ballet is defined by an era during the early to mid 19th century (the romantic era) in which ballets featured themes that emphasized intense emotion as a source of aesthetic experience. The plots of many romantic ballets revolved around spirit women (sylphs, wilis, and ghosts) who enslaved the hearts and senses of mortal men. 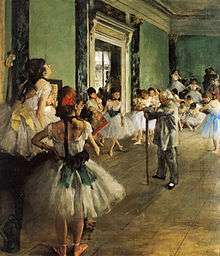 The 1827 ballet La Sylphide is widely considered to be the first, and the 1870 ballet Coppélia is considered to be the last work of romantic ballet. Famous ballet dancers of the Romantic era include Marie Taglioni and Fanny Elssler. Classical ballet is based on traditional ballet technique and vocabulary. There are different styles of classical ballet that are related to their areas of origin, such as French ballet, Italian ballet and Russian ballet. Several of the classical ballet styles are associated with specific training methods, which are typically named after their creators. 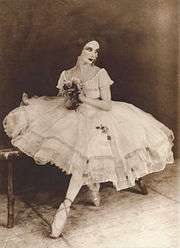 For example, the Cecchetti method is named after its creator, Italian dancer Enrico Cecchetti and the Vaganova method is named after Russian ballerina Agrippina Vaganova. The Royal Academy of Dance method is a ballet technique and training system that was founded by a diverse group of ballet dancers. They merged their respective dance methods (Italian, French, Danish and Russian) to create a new style of ballet that is unique to the organisation and is recognized internationally as the English style of ballet. Some examples of classical ballet productions are: Swan Lake, The Nutcracker, and Sleeping Beauty. Neoclassical ballet is a style that utilizes classical ballet technique and vocabulary, but deviates from classical ballet in its use of the abstract. In Neo-Classical Ballet, there often is no clear plot, costumes or scenery. Music choice can be diverse and will often include music that is also Neo-Classical (e.g. Stravinsky, Webern). Neo-Classical ballet opens up the use of space to multiple possibilities, as the elimination of the necessity of formalities and story telling allows far more possibilities for architecture and design in choreography. Tim Scholl, author of From Petipa to Balanchine, considers George Balanchine's Apollo in 1928 to be the first neoclassical ballet. Apollo represented a return to form in response to Sergei Diaghilev's abstract ballets. Balanchine worked with modern dance choreographer Martha Graham, expanding his exposure to modern techniques and ideas, and he brought modern dancers into his company (New York City Ballet) such as Paul Taylor, who in 1959 performed in Balanchine's Episodes. While Balanchine is widely considered the face of Neo-Classical Ballet, there were others who made significant contributions to the development of the style. Fredrick Ashton’s Symphonic Dances (1946) is a seminal work for the choreographer, and is a work staged in white tunics, abstract and minimal set design with no discernable plot. Set to César Franck’s score of the same title, it is a pure-dance interpretation of the score in a manner that exemplifies the Ashton style. The Kansas City Ballet performing, pictured in 2015. Another form, Modern Ballet, also emerged as an offshoot of neo-classicism. Among the innovators in this form were Glen Tetley, Robert Joffrey and Gerald Arpino. While difficult to parse modern ballet from neo-classicism, the work of these choreographers favored a greater athleticism that departed from the delicacy of ballet. The physicality was more daring, with mood, subject matter and music more intense. An example of this would be Joffrey's Astarte (1967), which featured a rock score and sexual overtones in the choreography. Contemporary ballet is a form of dance that opens up the doors for any style to influence a work made utilizing ballet technique. Contemporary ballet can take on a wide variety of aesthetics, incorporating pedestrian, modern, jazz, or ethnic forms, so long as the roots of classical ballet are apparent. It allows for open-ended exploration and experimentation, but a good way to determine if a work is contemporary ballet, as opposed to contemporary dance, is to ask the question, is ballet training needed to perform this as it was intended?. Again, it can sometimes be difficult to parse this form from neo-classical or modern ballet. Some prime examples of this would be Twyla Tharp’s Deuce Coupe (1973) for the Joffrey Ballet. In this ballet, Tharp juxtaposed a ballerina clad in white who makes her way through the lexicon of ballet steps, while dancers clad in street clothes, sometimes in pointe shoes, socks or sneakers, dance in wide range of styles to the music of the Beach Boys. In the 1980s William Forsythe made substantial innovations in contemporary ballet with a range of works, including In the Middle Somewhat Elevated (1987). This work featured a robust athleticism and electric score. Forsythe took classical ballet vocabulary and exaggerated it, making the dancers move bigger, faster and in more directions than before. Many contemporary ballet concepts come from the ideas and innovations of 20th-century modern dance, including floor work and turn-in of the legs. This ballet style is often performed barefoot. 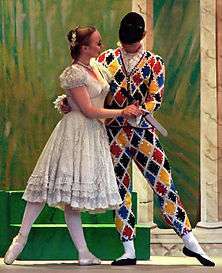 Contemporary ballets may include mime and acting, and are usually set to music (typically orchestral but occasionally vocal). George Balanchine, the founding director of the New York City Ballet, is considered to have been a pioneer of contemporary ballet because of his pioneering development of neoclassical ballet. Another early contemporary ballet choreographer, Twyla Tharp, choreographed Push Comes To Shove for the American Ballet Theatre in 1976, and in 1986 created In The Upper Room for her own company. Both of these pieces were considered innovative for their melding of distinctly modern movements with the use of pointe shoes and classically trained dancers. The term ballet has evolved to include all forms associated with it. Someone training as a ballet dancer will now be expected to perform neo-classical, modern and contemporary work. A ballet dancer is expected to be able to be stately and regal for classical work, free and lyrical in neo-classical work, and unassuming, harsh or pedestrian for modern and contemporary work. The art form has grown vertically and horizontally and can sometimes be blurred with other dance forms, however the foundational elements of ballet technique will always be apparent. 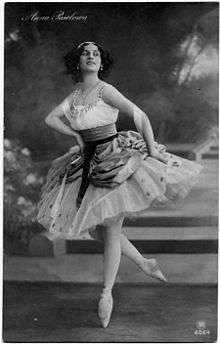 Anna Pavlova (prima ballerina); Early ballerina skirts were much more heavier and layered which made it difficult for ballerina's to create much movement. Ballet costumes play an important role in the ballet world. They are often the only survival of a production, representing a living imaginary picture of the scene. The roots of ballet go back to the renaissance time in France and Italy when court wear was the beginning of ballet costumes. Ballet costumes have been around since the early fifteenth century. Cotton and silk were mixed with flax woven into semitransparent gauze to create exquisite ballet costumes. During the seventeenth century, different types of fabrics and designs were used towards ballet costumes to make them much more spectacular and eye catching. Court dress still remained for women during this century. Silks, satins and fabrics embroidered with real gold and precious stones increased the level of spectacular decoration associated with ballet costumes.Women's costumes also consisted of heavy garments and knee-long skirts which made it difficult for them to create much movement and gesture. During the eighteenth century, stage costumes were still very similar to court wear but progressed overtime. 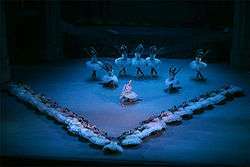 European ballet was centered in the Paris Opera. During this era, skirts were raised a few inches off the ground compared to the renaissance period and the seventeenth century. Overtime, costumes progressed as more designs and colors were used on ballet costumes. Flowers, flounces, ribbons, and lace emphasized this opulent feminine style, as soft pastel tones in citron, peach, pink and pistachio dominated the color range of stage costumes. During the early nineteenth century, close-fiting body costumes, floral crowns, corsages and jewels were used during this time. Ideals of Romanticism were reflected in female stage. Costumes became much tighter as corsets started to come into use to show off the curves on a ballerina. Jewels and bedazzled costumes became much more popular. During the twentieth century, ballet costumes transitioned back to the influence of Russian ballet. Ballerina skirts became knee-length tutus later on in order to show off pointe work and mainly the technique of ballet dancers. During this era, costumes focused on the importance of a ballet dancers work and dance practice. Colors used on stage costumes also became much more vibrant. Designers used colors such as red, orange, yellow, etc. to create visual expression when ballet dancers perform on stage. 1 2 Liddell, Henry George; Scott, Robert. "A Greek-English Lexicon". Perseus Digital Library. ↑ Craine, Deborah; MacKrell, Judith (2000). The Oxford Dictionary of Dance. Oxford University Press. p. 2. ISBN 978-0-19-860106-7. It is from this institution that French ballet has evolved rather than the Académie Royale de Danse. ↑ Wulff, Helena (1998). Ballet Across Borders: Career and Culture in the World of Dancers. Oxford: Berg. p. 44. ISBN 1-85973-998-9. ↑ Grant, Gail (1982). Technical Manual and Dictionary of Classical Ballet. New York, US: Dover Publications. ISBN 978-0-486-21843-4. ↑ "Ballet Costume History - Tutu Étoile". Tutu Étoile. Retrieved 2016-11-18. Chisholm, Hugh, ed. (1911). "Ballet". Encyclopædia Britannica (11th ed.). Cambridge University Press.